Today, Webster University’s President Elizabeth (Beth) J. Stroble and Provost, Senior Vice President and Chief Operating Officer Julian Schuster appointed Vincent C. Flewellen as the new Chief Diversity Officer for the University. For the past two years, Flewellen has served as the director of equity and inclusion at the College School of Webster Groves. The College School is a private, independent school focused on educating children from pre-kindergarten through eighth grade by using experiential learning and other techniques. Webster University and the College School are long-time partners with historic links. 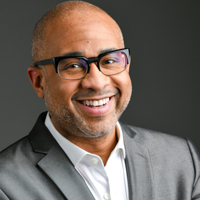 In his role at Webster University, Flewellen will provide key leadership for the University’s core value of advancing diversity and inclusion as part of the educational mission through the University’s network of domestic and international locations. "As Webster's next Chief Diversity Officer, I am thrilled and honored to have the opportunity to join President Stroble and Provost Schuster in identifying and pursuing opportunities for education and cultural transformation that further advances Webster University's mission and core values university wide,” Flewellen said. “I am grateful for the opportunity to champion and advocate for inclusive means to create, direct and oversee the development and implementation of a diversity and inclusion plan that produces programs and initiatives in collaboration with the leadership team. I look forward to serving a diverse group of constituents including students, faculty, staff, alumni and the greater St. Louis community." Before taking on his role at the College School, Flewellen served as the director of the University City Children’s Center. He has taught in the Ladue School District and for the Mary Institute and St. Louis Country Day School. Also, Flewellen has served as an adjunct instructor of social work for Washington University’s Brown School of Social Work for the past six years, and he served as a consultant to Washington University in 2006 and 2007. For the past 16 years, he has served as a consultant on diversity and inclusion issues for a variety of schools and organizations, including: the Kirkwood School District; the John Burroughs School; the Forsyth School; the Cochran Community Center; and FOCUS St. Louis. Flewellen has also served as the director of development for the St. Louis non-profit Neighborhood Houses (now known as Unleashing Potential). Flewellen served as a program director for Teach for America in St. Louis and he was a coordinator for the Missouri Coalition for Lifesaving Cures. Flewellen holds a Masters of Social Work from the Brown School of Social Work at Washington University and his BA in education is from Maryville University. Flewellen will begin his new duties at Webster University on Oct. 15, 2018. The College School’s partnership with Webster University can be traced back to 1963 when leaders at Webster created the College School with support from a Carnegie Foundation grant. The College School was originally designed to highlight the alternative and pioneering educational methods that innovators in education at Webster were advancing by putting their ideas into direct practice. The College School eventually became independent from the University in 1978. Since President Stroble’s arrival at Webster in 2009, the University has made major strides in the area of diversity and inclusion, including the creation of the position of chief diversity officer. The signature event created by that office is the successful annual conference to discuss these themes. Last year’s third annual conference was attended by hundreds and the conference has featured speakers of local, regional, and national renown. Also, Webster’s leadership and the chief diversity officer have strengthened the bonds between the University and key community groups such as the Urban League and the Alliance for Interracial Dignity. Other diversity initiatives at Webster University since 2009 have included: the creation of a campus in Ghana; five times more funding to increase scholarships for study abroad students; double the number of endowed scholarship funds to support diverse populations; increased the number of endowed scholarship funds to recruit international students; and a partnership with the African Renaissance and Diaspora Network (ARDN) to raise awareness about HIV-AIDS and provide education about prevention programs. The University has also created the Transitions and Academic Prep (TAP) program to aid freshmen and transfer students who are the first in their families to attend college. This year, in its annual college rankings, U.S. News & World Report rated Webster as having one of the best study abroad programs nationally. Those rankings also rated Webster as one of the best regional universities for veterans.